This weekend I actually got to shop till I dropped! And what did I fall in love with?! A new pair of jeans! I ended up buying 2 pairs of the same exact jeans because they were so comfy & cute! 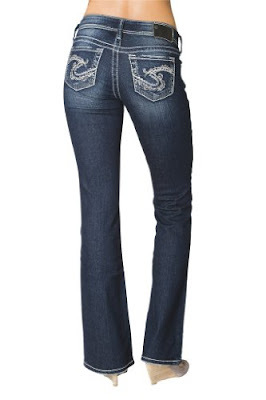 My new obsession... Silver Suki Bootcut Jeans. I have a good sized behind & these make it look amazing! I hate shopping for jeans, I look TERRIBLE in skinny or straight jeans, so it makes jean shopping right now super hard. I tried these on & fell in love. I also got some super cute American Rag tanks that are adorable & yet not online. But I'm sure you'll see them in pictures that will be posted soon!